Each spring, thousands of young students and their elders descend on Howard and our sister institutions in the glorious annual rite of the HBCU college tour. Wide-eyed prospectives from fifth through twelfth grades from cities across the country make annual pilgrimage to my classes. Our Howard University Alumni Club of Atlanta family, riffing off of a mid-February Howard Twitter account declaration, presented me with a t-shirt at the close of their visit emblazoned with the phrase: “Howard is Our Wakanda." Instead of “Wakanda Forever,” Chad Boseman, the Marvel’s Cinematic Universe’s Black Panther, declaimed “Howard Forever!” at his Alma Mater’s 150th commencement ceremony. Beginning his 27 minute speech by evoking the genealogy of teachers, most now Ancestors, who trained him in the craft that has made him famous globally, the 40 year old Boseman presented a powerful mediation on the value of place, community and standing in truth. Most of the attendees (and most moviegoers), untutored in T’Challa’s 52 year comics history and long-arc storylines involving Thanos, Infinity Gauntlets, “Secret Wars,” Kree-Skrull battles and other epic saga sources of Marvel’s movie machinations, are still reeling from unexpected traumas of Black Hero Death in “Infinity Wars: Part I.” Fear not: Having attracted a billion dollars of a heretofore undertapped Black demographic’s money into the MCU, Marvel will not soon allow T’Challa, Heimdall, Falcon, Nick Fury, Gamora and kin to go gently into that good cinematic night. Future months of agony and speculation should, however, remind us of Howard 1978 Honorary Doctor of Humanities recipient Stevie Wonder’s line in his 1972 song “Superstition”: “When you believe in things you don’t understand, then you suffer.” There are bright lines between fantasy and reality. As inevitable and imaginative showers of ironic, acerbic and comedic replies to the Twitter “Howard is arguably collegiate Wakanda” declaration reminded us, Howard is not Wakanda. No HBCU is. How could we be? An Afro-futurist Wakanda flows from a central question in our subaltern imaginary: What might Africa be had it never been colonized? 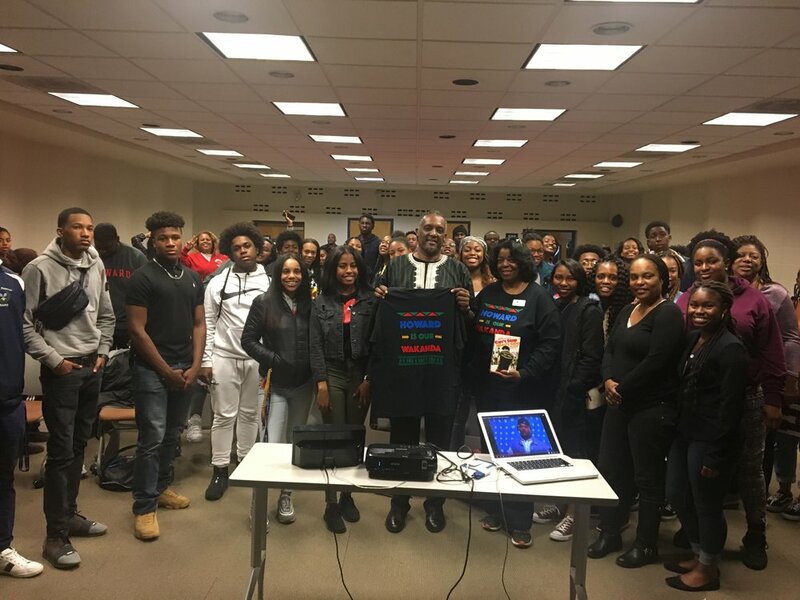 Howard students enrolled at a univeristy shaped by and preoccupied with finding answers to help forestall or negate perpetual existential threats to Africans, far too rarely ask—much less imagine layered answers—to such a question. The transformative natural resource of Wakanda is the Vibranium mound. Howard’s transformative resource is, and will always be, its people. As I wrote in the afterword to Todd Burroughs’s book “Marvel’s Black Panther: A Comic Book Biography, ” Wakanda is an American African fantasy. HBCUs are not Wakandas, any more than the African Diaspora or post-colonial Africa are Wakandas. As Black Panther comic writers from Don McGregor to Christopher Priest, Reginald Hudlin and Ta-Nehisi Coates have shown us, Wakanda represents a place to complicate questions of an African utopia, literally an African no place. The responsibilities of Howard and our sister institutions are greater than those of any imaginary Africas. Memories, dreams and visions of generations of future Africans seek us as real destination repositories and sites of possibility, not imaginary ones. Comparing Howard to Wakanda reveals that desire. It is not a desire defined by soaring SAT scores and grade point averages but by demonstrations of heart and will that are far more relevant barometers of African and broader human possibility. The most current threat to the fuel for such a machine for the imaginary is a self-celebratory academic and popular culture that threatens to replace substantive effort with glosses of effort. As Wakanda’s Shuri’s cultural-scientific mastery reminds us, Wakanda’s genius is a cultivated one. When we do not seek hearts and wills of collective purpose as students, faculty or staff, we run the risk of conflating institutional excellence with the fragile appearance of individual mastery. Our Killmongers, stripped even of Michael B. Jordan’s righteous indignation, become masters first in damnable alchemies of finesse. Mastery work is slow and accretive. At Black Universities, it must never be disassociated with thinking work for collective liberation. Wakandans would never celebrate the to-be-expected as exemplary. Neither should we. Proxy Wakandas in the Global HBCU firmament emerged out of liberation struggles, from Legon, Makerere, Ibadan and Fort Hare to the Caribbean’s UWI system. Black students who occupied Cornell and Columbia in 1968 and 1969 and who called for Black Studies and Black Cultural Centers at Brandeis, Oberlin, Ohio State, San Francisco State, Northwestern and elsewhere carved liberated Black spaces out of which to imagine and plan new Black worlds. And desegregation has further complicated liberation desires of HBCU students and Black students at HWCUs. Lines of debates between nationalism and assimilation captured in Laurence C. Morse’s brilliant 1986 novel of life at Howard and HBCUs, Sundial, are much more blurred now, birthing new possibilities for new thinking. Still, unlike what dreams of individual achievement youngsters on annual HBCU college tours might expect of HWCUs, Howard and our sister institutions are living Wakandas. They look to us for a larger common purpose. Unlike the home of T’Challa, Okoye, Shuri, M’Baku and their imaginary kin, these young people need fear no existential threat from Thanos or anyone else. Unlike the comics, they seek the places where we have everything we need to link our incomparable African pasts to our glorious African futures. The honorifics, from Capstone to Mecca to Wakanda to what will invariably come next out of Black creative imaginaries, are one school's generational labels among others to be found at all our our HBCUs, objects of that thankfully unquenched desire.